YAY Gallery presented the group exhibition "Think That Everything That Exists, Does Not Exist" with works by the artists Shahnaz Aghayeva, Aysel Amirova, Gunay Aliyeva, Leyli Gafarova, Fakhriyya Mammadova, Aydan Mirzayeva, Chinara Majidova, Parvana Persiani, Sheila Salamzadeh, and Leyli Salayeva on March 29. The title of the exhibition relates to a rubai by Azerbaijani poet Mahsati Ganjavi (12th century, born in Ganja) that talks about the impermanence, transitoriness and ephemerally of all existing things. Her poetry is a very early example of a strong female voice against prejudice, hypocrisy and patriarchy, while upholding love – both human and divine. The exhibition features works by young female artists inspired and related to notable women of the past and the present from the region’s history and mythology. The main goal of the exposition is to rediscover female voices considering the richness of women’s attitudes towards relevant topics of our times and dissolving gender stereotypes. The installation "NUR" (Light) by Shahnaz Aghayeva is a convex shaped shell made of highly polished steel, radiates a biting white light in sequential order imitating the blink of an eye, but at the same time makes it impossible to look at it. The work is inspired by women who pioneered in natural sciences and medicine. Aysel Amirova dedicates her work to Azerbaijani singer and songwriter Diana Hajiyeva that is the contemporary voice of the local music world. By using symbols such as the upside pyramid, light and outer space imaginary the work becomes an object talking in a more general sense about female figures, who influence the world with their creative energy. Gunay Aliyeva’s "New Object" relates to the collective’s name "Zamanin ganadlari" (Wings of Time) founded by Leyla Akhundzade and is a plaster cast of a wing object. Through the gesture of imitation and reprint, the work preserves the past but also explores the future, it shows how the creative process is passed from one generation to the other. The performance "Için?" developed as a cooperation work by Leyli Gafarova and Leyli Salayeva challenges the concept of female modesty trough traditional dance. Selected rubais’ of Azeri female poet Mahsati Ganjavi are performed by a group of women in a form of a ritual. Fakhriyya Mammadova’s wallpaper works form the background of the exhibition and resulted from a cooperation with the artists and the poet Leyli Salayeva. They are based on poems, writings by Leyli Salayeva, the artists themselves as well as excerpts from the original inspiration source of the works. Aydan Mirzayeva reinterprets the tale of "Tiq-Tiq Khanum" with a formal language that combines anime style and aquarelle painting. In the artist's version, the protagonist becomes a strong anime heroine, who, in contrast to the original story, can defend herself against the threats of the creatures she encounters on her way. Nevertheless, the artist retains the moral of the story, in the end the heroine turns into the black beetle as a consequence of defiant pride and vanity. In her photographs Chinara Majidova plays with social habits to push a girl to behave or dress more feminine, if her appearance doesn’t fit into social expectations. In her video work "Voice" she presents a women working on the Bazaar challenging the idea of woman as defenceless and unprotected. She emphasizes that the model of the strong man, breadwinner, head of the family doesn’t reflect any more new realities. Increasingly hard work, the role of the breadwinner, rests on the shoulders of women. In the work by Parvana Persiani diode lights are flashing up on a black mirror that forms the phrase "All Your Sadness Is Mine And All Your Joy", an excerpt from the artist’s poetry. The work delves into the topic of the emotionalisation of the virtual space, "old school romance" poetry with nostalgia to the analogue world is depicted in the cold aesthetics of the digital world. 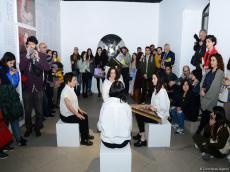 Shalala Salamzadeh’s installation connects two historical women, film director Gamer Salamzadeh and poetess Khurshidbanu Natavan, who were among the few examples of their time to brake with social stereotypes. These two objects do not only unite the idea of a women's the struggle for equality and justice, missed opportunities and regrets, but also about inexhaustible strength and renewal. In addition, the exhibition features a film screening program in cooperation with international Media Platform "Chai-Khana". Address: Icheri Sheher, 5, Kichik Gala str.